CNN brings you live coverage of the second semifinal of Brazil 2014 from Sao Paulo. The winner will play Germany in Sunday's final. It's a scenario all Brazilians feared. Not only will their football heroes not be playing in the World Cup final, but the prospect of watching fierce rival Argentina lift the trophy in Rio de Janeiro is now looming large. The only thing standing between Lionel Messi's team and a Sunday date at the Maracana stadium is the Netherlands -- a country who will gain 200 million extra fans once tonight's match kicks off in Sao Paulo. I'm Tom McGowan, who's ready for the second semifinal of the 2014 World Cup? Let's get started. 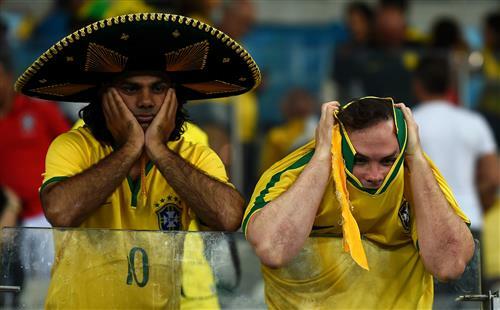 Brazil fans were left devastated by Tuesday's 7-1 defeat to Germany. For those of you who have been living under a rock for the past 24 hours, here's a quick recap of Tuesday's semifinal. Germany rolled in Belo Horizonte, smashed in SEVEN goals and sent Brazilian football back to the stone age on its way to booking a place in the World Cup final. Shocked, devastated, dumbfounded and heartbroken are all adjectives which come close to describing Brazil's national mood. You can read our report on a jaw-dropping match right here. How do you follow that? With another heavyweight tussle, that's how. Tonight it's a rematch of the 1978 final, it's the Netherlands vs. Argentina, it's Arjen Robben vs. Lionel Messi. I can't promise you another 7-1 (it still doesn't feel right typing that), but I can promise you tension and drama by the bucket load. As always, we want to hear from you ahead of another Europe vs. South America clash. Where are you watching the match? Who would you like to see in the final? Have you recovered from last night yet?! Let us know by tweeting the hashtag #CNNWorldCup or by using the comment box. What are you waiting for? Get involved!